Photo is taken by a family member in Geestemünde, Bremerhaven, in the early 20th century. Many thanks to schepekees for this excellent information. This vessel is the ore carrier Ocean (4314 grt) and owned by A/S D/S Ocean (P.A. Gron mgr. ), of sandefjord. She was built in 1908 by W. Dobson & Co., Newcastle (yard no.156.) Although the name of the vessel is invisible, she clearly has the funnels colours of P.A. Gron (Nordiske Skorsteinsmerker og rederiflagg by Stein-Erik Dagsland p.77).Typical is the six pointed star, as most stars in funnels have five points. In 1915, management changed to Christensen & Stenseth. In 1916 the vessel was sold to Lauritz Kloster, of Stavanger and renamed Mia. 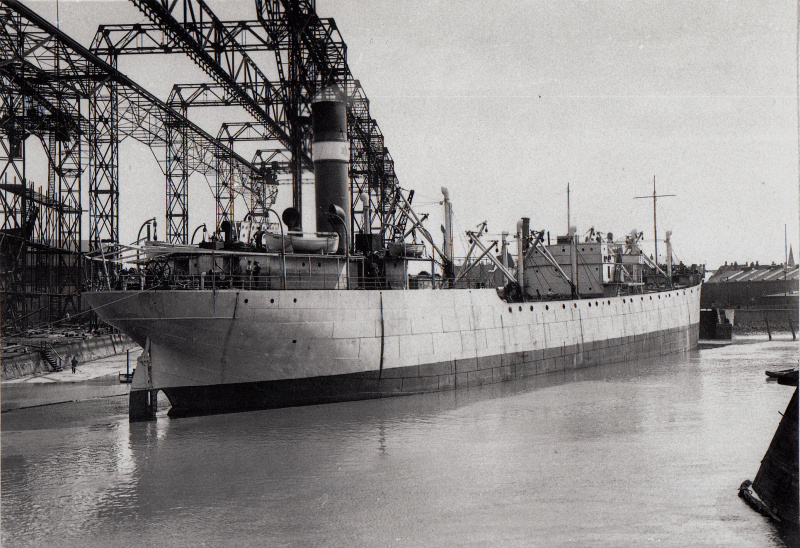 In 1917 she was sold to D/S A/S Flint (Kubon & Sem-Olsen mgrs. ), of Bergen and renamed Flint. In 1923 Willy Kubon become sole mananger. On August 31st 1928 she went ashore at Ryholmen whilst on voyage from Kirkenes to Rotterdam with iron ore.. She was holed by a salvage vessels while ashore, was refloated but sank on September 2nd. On wrecksite.eu a photo can be found showing the ship ashore. Hallo Manfred, you are right. On the backside were no information so I thought, it was the Deutsche Werft in Hamburg. In my opinion the location is definitely not Hamburg but Tecklenborg, Geestemünde(Bremerhaven)if you compare the most right fixed cranes in the photo within the link. It is not the Maersk star. This photo has been shown 1,037 times since it was added to the site.